A team of UK and U.S. polar scientists are about to embark on one of the largest joint Antarctic missions for more than 70 years. 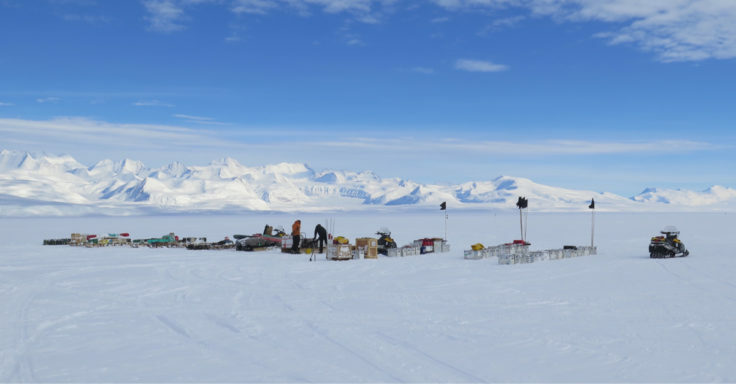 It’s the first field season of a five-year quest to understand the contribution that the Thwaites Glacier in West Antarctica will make to global sea level. Support teams will cover about 7000 km in extremely cold and hostile conditions as they get field camps and supply depots set up and ready for the arrival of science teams. 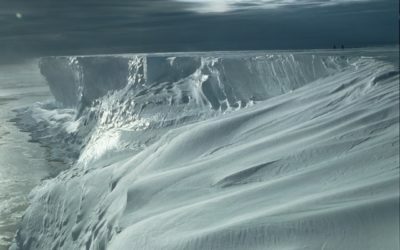 Currently, the amount of ice draining into the sea from this West Antarctic Ice Sheet glacier accounts for around four per cent of global sea-level rise. Scientists are concerned that a collapse of the Thwaites Glacier could significantly raise global sea levels. The mission is urgent. Scientists need to understand whether the glacier is likely to begin to collapse within the next few decades or within centuries. The £20 million (approx. $25 million) research collaboration, funded by the UK Natural Environment Research Council and the US National Science Foundation, involves over 100 scientists and support staff. Thwaites Glacier is extremely remote and difficult to reach. It is equidistant from the US McMurdo Station and UK’s British Antarctic Survey (BAS) Rothera Research Station. Each research station is more than 1600km away from the study sites on the glacier. Getting science and support teams to where they need to be is a massive joint operation involving tractor traverses, aircraft operations and ship-borne support. The five-year programme begins in November 2018 and continues to 2023. During the coming Antarctic field season a suite of scientific investigations will take place at sea, in the air and on the ice. 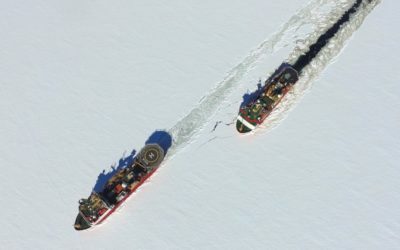 In early 2019, four large tracked vehicles, 14 snow mobiles, many sledges, two living cabooses, fuel and nearly 5000 days of food will be off-loaded at the ice edge by the British Antarctic Survey’s logistics ship RRS Ernest Shackleton with support from the Royal Navy polar patrol ship HMS Protector. A team of field support staff will then establish a depot before traversing south to set up two additional camps. Over 20 researchers will set sail in late January on the US icebreaker Nathaniel B Palmer. 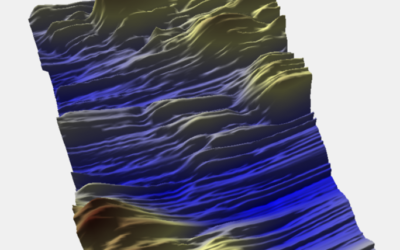 Research teams on board will map the seafloor – using swath bathymetry – around the ice front of Thwaites Glacier to see how the shape of the bed affected the glacier’s behaviour in the past. They will collect sediment cores from the seabed, which will reveal the extent to which past glacier retreat has been driven by interactions with the ocean, and will deploy ocean gliders and autonomous vehicles to collect data to discover how the glacier interacts with the ocean today. 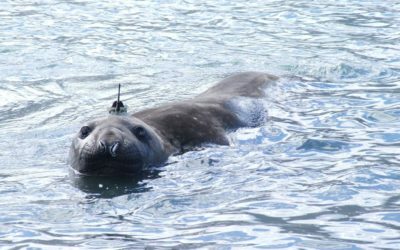 Tagged Weddell and Elephant seals that haul out on nearby islands will capture data about their behaviour and the ocean conditions where they dive. Science teams will collect samples of rock, penguin bones, algae and shells from nearby islands to carbon date them so they can determine how sea level has changed in the past 5000 years. All this information will improve reliability of the ice sheet models that are used to predict future sea level change. Scientists will travel through the US McMurdo research station to identify field sites for hot water drilling, radar and seismic investigations for future field seasons. In addition, British Antarctic Survey will fly its Twin Otter aircraft, equipped with air-borne radar, to collect data on the ice thickness and for estimating the sea-bed depth. A team will fly in lines across the glacier to identify the best sites for future on-ice field work. Throughout the November to February field season, ski-equipped LC-130 Hercules aircraft, flown for NSF by the 109th Airlift Wing of the New York Air National Guard, will deliver fuel from NSF’s McMurdo Station deep into West Antarctica and establish camps in preparation for next season’s major land-based work. Using seismic and radar methods on the ice, GHOST will investigate and quantify the sediment, hydrology, and bedrock underlying the glacier. Measuring ocean circulation and thinning beneath the floating part of the glacier using state of the art technology such as AUVs and automated land-ice stations, TARSAN will investigate how the ocean and atmosphere are affecting the glacier. Investigating sediments deposited in the seas near the glacier, THOR will reconstruct past changes in environmental conditions and the glacier’s response to these, thereby adding context to our projections of future change. By combining existing computer simulations of ice and ocean near the Glacier, PROPHET will improve models to reduce the uncertainty in the projection of the glacier’s behaviour and subsequent contribution to sea-level rise in the future. The Natural Environment Research Council (NERC) is the UK’s main agency for funding and managing research, training and knowledge exchange in the environmental sciences. Our work covers the full range of atmospheric, Earth, biological, terrestrial and aquatic science, from the deep oceans to the upper atmosphere and from the poles to the equator. We coordinate some of the world’s most exciting research projects, tackling major issues such as climate change, environmental influences on human health, the genetic make-up of life on Earth, and much more. NERC is part of UK Research and Innovation, a non-departmental public body funded by a grant-in-aid from the UK government. Find out more at nerc.ukri.org. The U.S. National Science Foundation (NSF). The U.S. Congress in 1950 established the Foundation “to promote the progress of science; to advance the national health, prosperity and welfare; to secure the national defense; and for other purposes.” NSF is vital because its supports basic research to create knowledge that transforms the future. With an annual budget of $7.8 billion (fiscal year 2018), NSF funds discovery, learning, innovation and research infrastructure to boost U.S. leadership in all aspects of science, technology, engineering and mathematics (STEM) research and education. In contrast, other federal agencies support research focused on specific missions, such as health, energy or defense.